Today I have a secret recipe for an IHOP dish that is great for breakfast, lunch, dinner or dessert. Belgian waffles are made with a lighter batter and have larger squares and deeper pockets than ordinary American waffles. These waffles are perfect for toppings. They taste great with simply just maple syrup, but you can also top with fresh berries and whipped cream or even ice cream and hot fudge. Feel free to get creative with your toppings. Serve hot and fresh with berries and whipped cream! Today I have a secret recipe for a yummy dish served at IHOP. 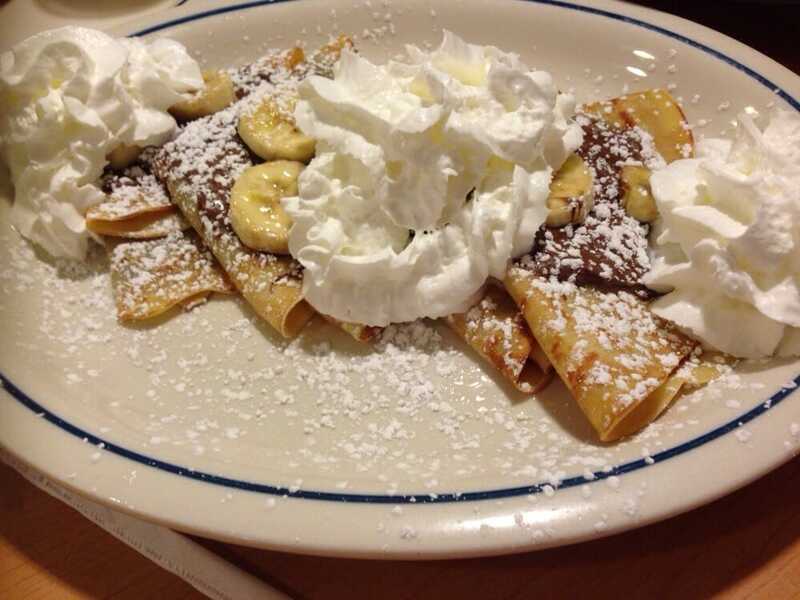 A crepe is a very thin pancake and at IHOP they elevate this dish by filling them with Nutella hazelnut spread and freshly sliced bananas. Top with some confectioners sugar and some whipped cream if you like. This decadent treat can be enjoyed for breakfast or dessert. To make the batter: combine the flour, eggs, melted butter, and salt in a large mixing bowl. Gradually add the milk, then the water, whisking to prevent any lumps. Heat a 10″ nonstick pan over medium heat. Add enough butter to coat, then add 2 tablespoons of the crepe batter and swirl the pan to cover it in a thin, even film (use a rubber spatula to help, if needed). Cook on the first side to 3 to 4 minutes, until the bottom takes on a deep golden brown color. Flip and slather a tablespoon of the Nutella down the middle of the crepe, then top with a scant quarter of the banana slices. Cook for 3 to 4 minutes longer, until the bottom is golden brown. Fold the crepe sides over the filing and slip onto a plate. Top with a few slices of banana and a shake confectioners’ sugar if you like. If you enjoy the taste of cornbread then you’ll love today’s secret recipe for IHOP’s(tm) corn cake pancakes. This recipe takes the classic buttermilk pancake and enhances it with the addition of cornmeal. Serve these tasty pancakes with butter and syrup. When you make this batter, let it sit for at least 10 minutes before pouring the batter on the griddle. This will allow the batter to thicken a bit. Preheat a griddle to medium. Combine flour, cornmeal, baking powder, baking soda and salt in a medium bowl. In another medium bowl, mix eggs and sugar with an electric mixer on medium speed for 30 seconds. Add the milk, buttermilk and melted butter; mix well. Mix the dry ingredients into the wet ingredients with the mixer until smooth. Let the batter sit for 10-20 minutes. Spray the hot griddle with nonstick spray. Spoon 1/4 cup portions of the batter onto the hot griddle and cook for 2 to 3 minutes per side until brown. Serve hot with butter and maple syrup. If the thought of fluffy pancakes layered with cinnamon-sugar and cream cheese icing is heavenly to you, then you will be excited to try today’s secret recipe. IHOP’s Cinn-A-Stack pancakes are a seasonal addition to the IHOP menu, but now you can prepare this delectable breakfast creation at home year-round. To save time, you can certainly use store-bought icing in this recipe. After making this dish, if you have some leftover cinnamon mixture, it goes great on a piece of toast. In a small bowl combine the butter, brown sugar, cake flour, cinnamon, salt, and vanilla. Stir until well blended; set aside. Please note this should make a nice thick paste. Use a mixer to blend together the cream cheese and the butter until light and fluffy. Slowly add the powdered sugar. When the powder sugar has been incorporated blend in the milk and the vanilla. Place the dry pancake ingredients (flour, baking powder, sugar, salt, and baking soda) into a bowl, and stir to blend the dry ingredients. Add butter milk, oil, and egg. Use a spoon to mix the pancake batter and beat until just smooth. Heat a skillet or an electric griddle to 350 and spray with non-stick spray.. Pour about 1/2 cup of batter to form a 4-inch pancake. When the pancakes start to show small bubbles on top, turn them over to finish cooking. 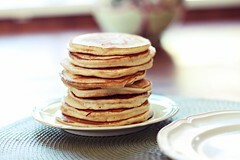 You can assemble the stacks just before servings. Spread 2 teaspoons of the cinnamon mixture over one pancake, layer another pancake on top, spread 2 more teaspoons of cinnamon mixture over the top, and then drizzle with the cream cheese icing. 3) Drop 2 Sizes In Only 28 Days!